I was about nine when my Nana dropped off a pile of books, bought at some jumble sale or other because I was known for my peculiar love of reading. It was a strange assortment of children’s books including the sentimental nineteenth century novel The Wide Wide World (I never managed to read it, but prized it for its gilt edges) and several Biggles titles (also impenetrable despite my taste for adventure stories). But amidst these, a treasure: the UK first edition of Ursula Le Guin’s A Wizard of Earthsea (1968). It was a book which would furnish my childhood imagination and immeasurably enrich my life. As the many tributes prompted by the news of Le Guin’s death demonstrate, I was one of many. The island of Gont, a single mountain that lifts its peak a mile above the storm-racked Northeast Sea, is a land famous for wizards. Among Le Guin’s many wonderful qualities is her worldbuilding, which for me is unsurpassed in the realm of fantasy literature. Not only the landscape, but the politics, economics, and customs of her imaginary worlds are depicted in detail and depth. 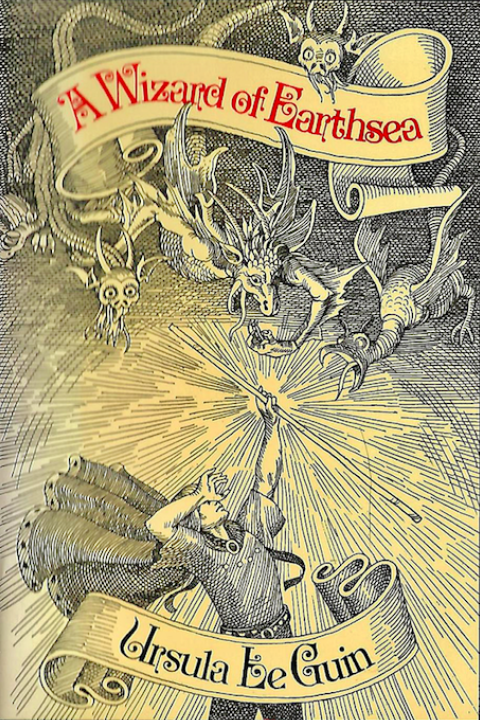 A Wizard of Earthsea begins with a conventional trope – an insignificant boy discovering he is a powerful wizard – but in Le Guin’s books magic is never an easy solution but, like all power, must be used mindfully. This magic is built on words: in Earthsea, learning the true name of an object or person gives you power over that or them. This was an idea that resonated deeply with me as a bookish child, and which has continued to grow and take on new dimensions as I have come to understand the power of language and naming in the real world. Looking back, I realise that the importance of songs, stories and legends in her books also helped to set me on the path to studying Anglo Saxon and Medieval literature. Words matter, and what made Ursula Le Guin so great was her willingness to embrace this as truth, even when it meant scrutinising her own work. Setting out to write against the tradition of white dominance in fantasy, she showed that people of colour could be fantasy heroes (though her hero Ged was invariably whitewashed on covers), but later ruefully acknowledged that she was still unwittingly ‘writing partly by the rules as an artificial man’. This realisation prompted her to return to Earthsea and to revise it in ways which undid some of the fundamentals of her world. Tehanu (1990) does not simply overturn the idea established in the first book that women cannot be wizards: it fundamentally questions the basis of this gendered power and suggests that it must be remade altogether. 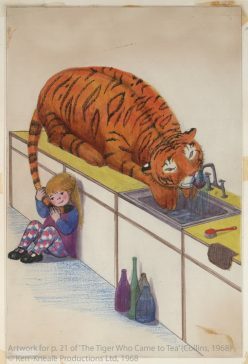 As a scholar of children’s literature, I continue to find meaning in children’s books of all sorts. But Le Guin, more than any other writer, has grown alongside me. At nine, A Wizard of Earthsea offered me a compelling vision of growing into adult power – and of its drawbacks. I was nearing my teens before I encountered The Tombs of Atuan (1971), which gave me a female protagonist undergoing her own growth. The dedicated high priestess of a female sect, Tenar holds power, of a sort, but it is the power allotted to women by a society which has turned its allegiance to men (we are told that most worship the twin God Kings) and it requires them to sacrifice love, and companionship, and growth. The book presages the revolution that Le Guin would return to in Tehanu: Tenar’s route to freedom lies in overturning the structures of power she has known, even at the cost of relinquishing her own position of power. The more radical revolution which takes place in Tehanu, which sees the wizard Ged without his powers and magic as we have known it leaking out of the world, confused and disappointed me on my first reading in my early teens. But as an adult I’ve grown to admire the radical changes Le Guin makes here, and to love the different kinds of magic she reveals through this book. Women’s work is magic here, and no less powerful because it is often positioned outside the realm of language. Ursula Le Guin was an activist to the last, speaking out against ‘alternative facts’ as recently as this February. Recognising that ‘the politics of Fairyland are ours’, she also showed how alternative worlds could help us revision the politics of our own. Thank you, Ursula Le Guin, for the mind treasures you gave us. I hope you’re flying on the other wind. Ursula K. Le Guin, Earthsea Revisioned (Cambridge: Green Bay Publications, 1993), p. 7. Ursula K. Le Guin, Earthsea Revisioned, p. 25. 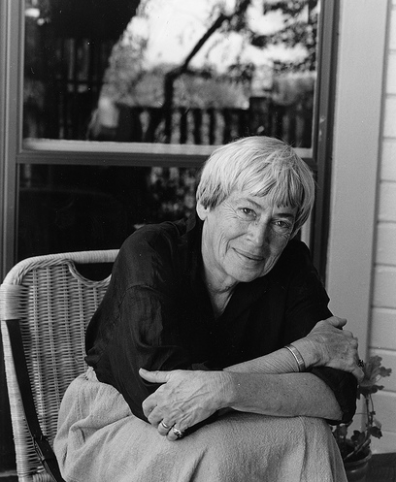 Featured image shows Ursula Le Guin by Marian Wood Kolisch, Oregon State University. Lovely, Lucy, thank you for articulating what many readers will be feeling.